Church bells clang, railroad tracks rattle and laughter leaps down the street. On a Sunday morning, the sounds of San Jose, Costa Rica waft through the gated window in my room at Hotel Colonial, landing on my bed along with the sun’s warm rays. Costa Rica’s capital is not a city known for alluring streets of colonial architecture. In fact, the entirety of the country lacks the rows of fine buildings found elsewhere in Central America such as in Granada, Nicaragua or Antigua, Guatemala. This is so partly because, due to lack of resources and indigenous labor, what is now Costa Rica was one of the least colonized areas of during the Spanish conquest of the Americas. Additionally, the city of Cartago, not San Jose was the original capital city, and many older buildings throughout the country have been destroyed by earthquakes over the year. 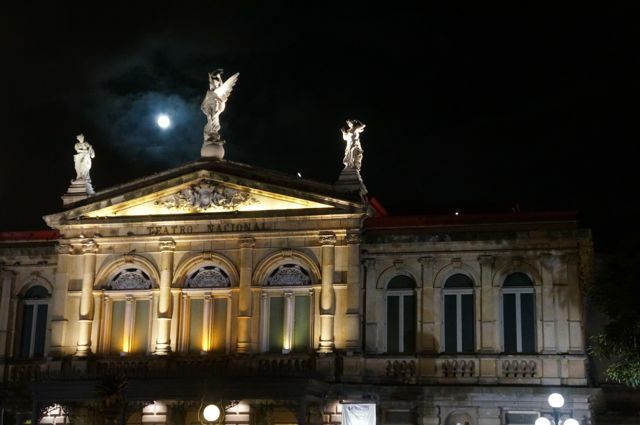 The finest example of colonial architecture in San Jose today is the Teatro National, or National Theater. 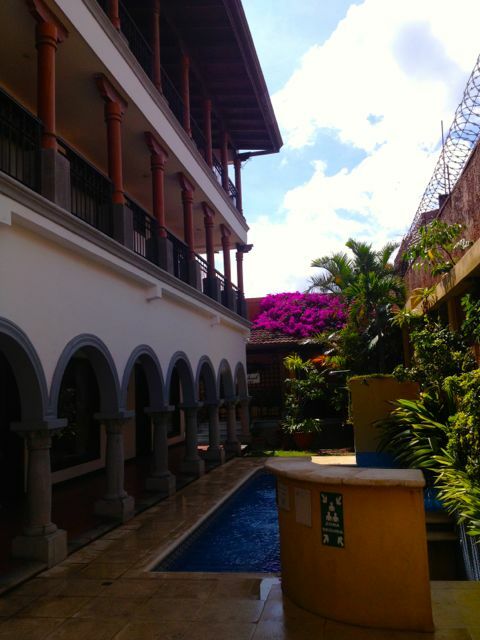 Hotel Colonial, while not an original colonial building, has been constructed in a style reminiscent of Costa Rica’s lost buildings from the 16th and 17th centuries. The hotel was originally built as a family home for don Antonio Urgelles Ferrer, a Spanish wood carver. He began construction on the house in 1947, carving many wooden features, such as the front door, by hand. His family lived in the house until 1996. In 2002, the house was sold to develop into a hotel. After a little more than two years of restoration, the hotel opened in 2005. Hotel Colonial has 17 rooms. 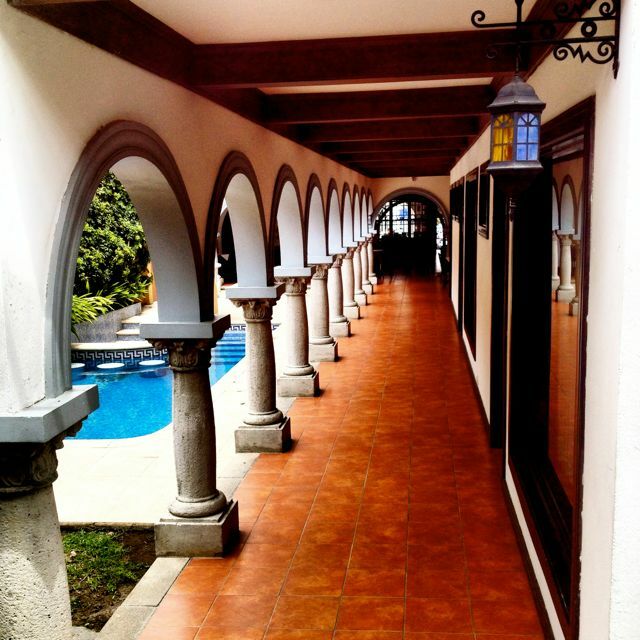 The front of the hotel has a garden adorned with twisted columns and tile features. The lobby looks out upon a terrace and internal garden, which are nice spaces to relax or curl up with a good book. The hotel is also one of the few in San Jose that has a pool. The hotel still retains the feel of a real home and all rooms open up to balconies. From the balcony in front of my room, I could see rooftops of buildings in the city center and mountains of the Central Valley out in the distance. 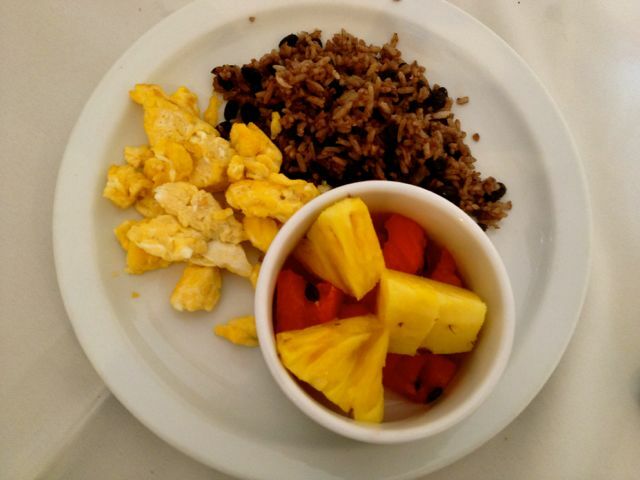 All stays include a traditional ‘tico’ breakfast of fresh fruit, scrambled eggs and gallo pinto, a dish of rice and beans. One of my favorite aspects of staying here was the convenient location. 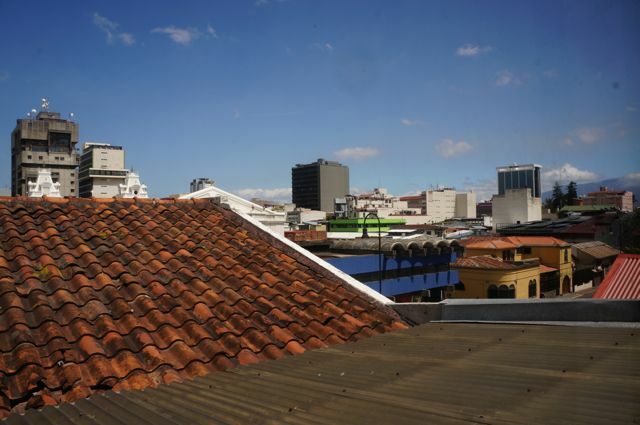 The hotel is in the East part of San Jose, less than a five minute walk from the National Museum of Costa Rica, Artisan Market and Jade Museum, the city’s newest offering on the cultural scene. As a single woman traveler staying at this hotel alone I felt very safe staying here. San Jose is not known for being the safest city in the world, and at night certain streets can be dangerous. Sometimes, even on the main streets in daylight, I’ve found myself being shouted at while walking. (Admittedly these remarks are just more annoying than they are threatening). 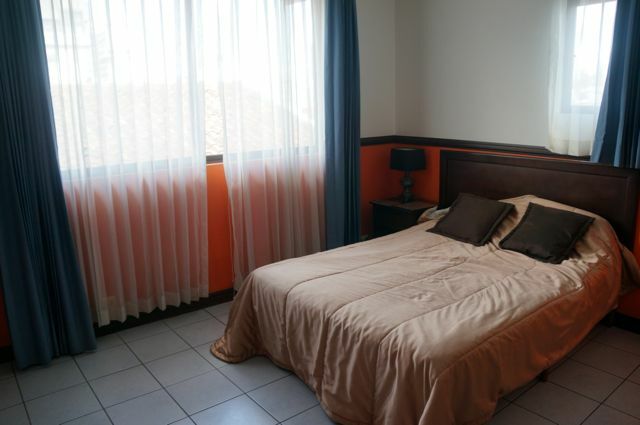 This hotel is located on a very calm street not far from Avenida 2, the main road that cuts through the city. It sits across from two upscale restaurants. I did not have any problems with walking along this street alone. The hotel also has a high level of security. The front door is locked and guarded 24/7 by staff. Guests have to show their hotel key and be buzzed in to enter. Additional guests who aren’t on the reservation are not permitted to enter. Translation: no prostitutes. I felt extremely safe during my stay and the staff was also super friendly and welcoming. 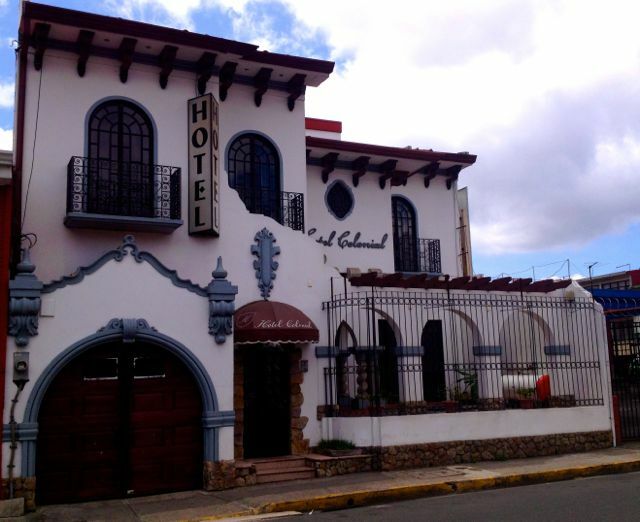 If you are looking for a safe and convenient place to stay during your visit to San Jose, definitely consider Hotel Colonial. Note: I was provided with a complimentary stay at Hotel Colonial. However, all thoughts and opinions are my own.